(From Our Own Correspondent.) LONDON, September 24. Lieutenant C. T. Maclean, Royal Fusiliers, attached to the Royal Flying Corps, who came back from France some weeks ago for treatment for an injured knee, has been passed for light duty, and has been sent up to Montrose for duty at the squadron station. After a month's work there he will most likely be sent back to the front. Mr Eliot King (New Plymouth) has been accepted for the Royal Naval Air Service, and is now a flight sub-lieutenant in that branch. Captain the Hon. J. D. Boyle, Rifle Brigade, attached to the Royal Flying Corps, has been promoted from wing adjutant to be temporary major while so employed. Flight-lieutenant Clive F. Collett, Royal Flying Corps (late of Wellington and well known in electrical circles), had the misfortune; some weeks ago to break his right leg and injure his nose in a fall at Hendon. He was testing a new Morane monoplane, and something went wrong with the engine when only 100 ft from the ground, the result being that there was no time to try and save himself. The safety-strap broke, and he fell. However, he is beginning to walk again after six weeks' treatment in hospital, and he hopes to get back to duty before long. Lieutenant Collett has made a number of aerial journeys to France and back, delivering new machines. In June, while at Salisbury, he had the honour of being chosen from the squadron to take part in in exhibition flight before the King, in a "Vickers 'fighting machine; and in the subsequent month he was one of four to fly from Salisbury to Bristol in connection with a demonstration which had been arranged for the Minister of Munitions. 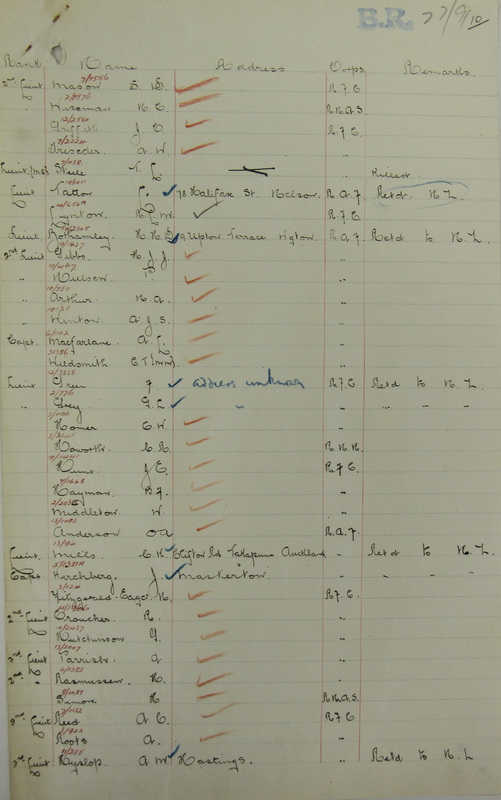 Second Lieutenant Keith D. P. Murray, Royal Flying Corps, Special Reserve (Auckland) is gazetted a flying officer. He went to France in August, and finds his work very interesting. 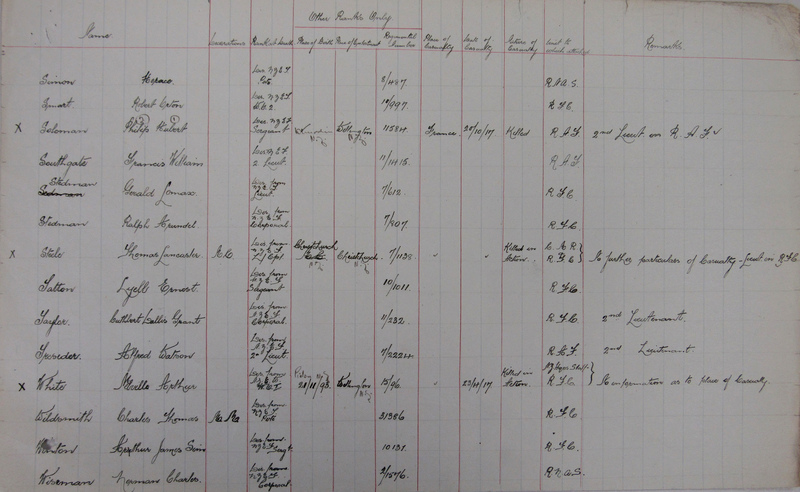 Looks like Eliot King was part of the Newton King clan, and therefore related to Miles Newton King, the founder of Rural Aviation. 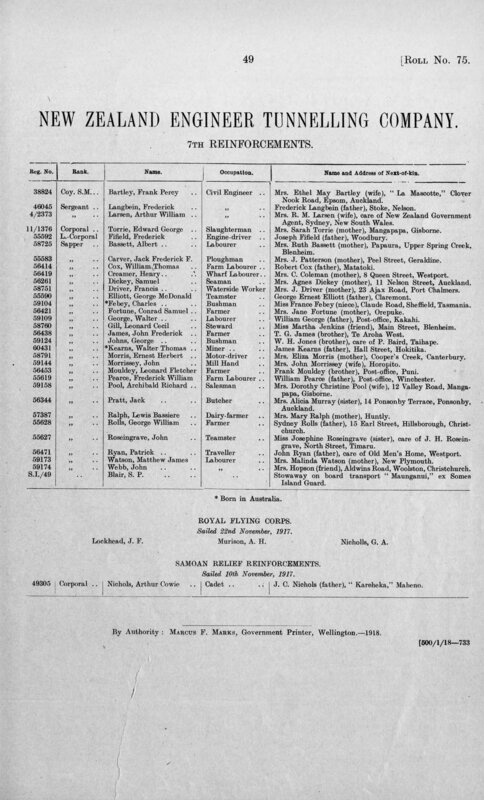 Another NZ airman not previously on this list is Lt Edgar Hastings Cambridge, Royal Flying Corps/Royal Air Force, of Auckland. Good to have this clarfied. Back to the drawing board. The link does not appear to work but there are three separate files for GAN at TNA. Our of curiosity, what is your particular interest in him? Nicholls was also big in the Gisborne/Ruatoria area motor car trade 1920s-30s. 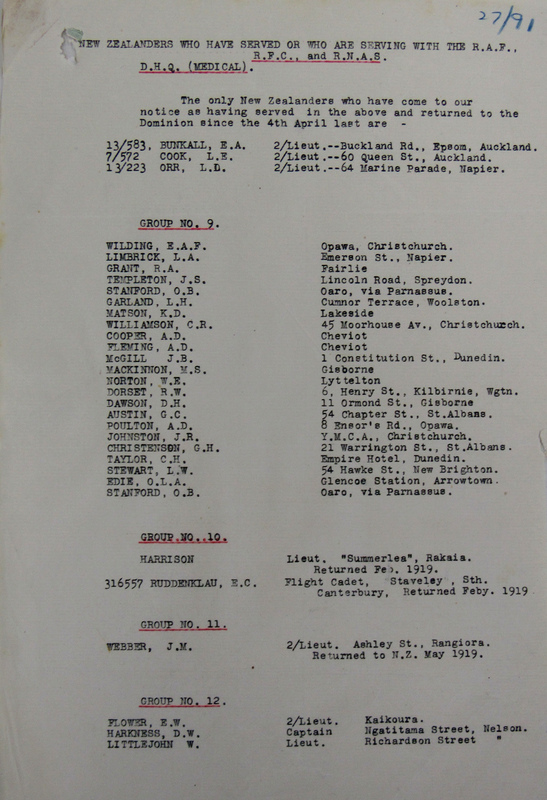 Ross Ewing and Ross McPherson's book "The history of New Zealand Aviation" states ..... Flt Lt Ernest Taniwha-Matarewha Sutherland"
This chap does not seem to have a service record online at the Archives New Zealand site. He does come up in Papers Past though, as Ernest Taniwha Sutherland, and it's not good. He became bankrupt in 1924, and in 1926 he attempted to kill his wife. (From Our Own Correspondent.) PALMERSTON N., February 12. Early on Thursday morning while a storm was raging the homestead of Richard Drummond, a native settler of Awahuri, near Feilding, was the scene of shocking outrage which resulted in two Native women — Mrs Drummond and her married step-daughter, Mrs Ernest Sutherland —being removed to the Palmerston North Hospital, suffering serious wounds. In addition to the murderous attack on the two women, their assailant set fire to the Drummond homestead, which, with its contents, was completely destroyed. Mrs Sutherland is suffering from a severe knife wound in the shoulder, which caused her to lose a large quantity of blood, and Mrs Drummond sustained severe facial injuries, as well as burns about the face and head. Drummond was also assaulted. These attacks are alleged to have been made by Ernest Taniwha Sutherland a half-caste, the husband of the younger woman, and the police with a warrant charging him with the attempted murder of his wife, are now seeking him. The outrage appears to have been the outcome of domestic difficulties which the Feilding magistrate was to have adjudicated upon to-day. According to the information in the possession of the police the trouble arose through the prospect of a separation order against Sutherland, which his wife had resolved to seek. Sutherland, it is alleged, called at the house about 8 o'clock on Wednesday evening with the object of endeavouring to have the application for a separation order cancelled. The house, which was a large two-storey one, stood back from the road about one mile on the Feilding side of Awahuri township. When Sutherland's request was refused he withdrew from the house, which was occupied by his wife, the three children, and Mr and Mrs Drummond. At about midnight Drummond was awakened by a glare outside his window and on rising found that a number of sacks saturated with kerosene had been placed under the house and were well alight. He aroused the other members of the household, end told them to get out as quickly as possible as portions of the house were already alight. He then endeavoured to pull out the sacks, and while doing so it is alleged Sutherland re-appeared and struck his father-in-law across the head with a hoe. A fierce struggle ensued and Drummond managed to secure the hoe, whereupon Sutherland disappeared. The former then went to the front of the house to seek his wife, at the same time telling his daughter and the three children to shelter in an adjacent shed. All were in their night attire. A heavy rain was falling but the wind quickly fanned the flames until the house was well alight. Drummond was unable to locate either his wife or Sutherland, and made for the shed. When on his way it is stated that he caught sight of Sutherland also making in that direction, but before Drummond could reach it Sutherland had, it is alleged, stabbed his wife in the shoulder. Then, as the older man approached, he turned and assaulted him again with a mattock and suddenly made off over a fence, disappearing into the night. Drummond, who was practically unhurt, renewed his search for his wife, whom he found severely injured about the face, and also suffering from burns. Apparently while Drummond was trying to pull the burning sacks from under the building, Sutherland entered the house and attacked Mrs Drummond. All this time the house and contents were burning, and the flames, fanned by a gale lit up the whole countryside with the result that it was nor long before the homestead was a smouldering mass of ruins. Other Maoris in the neighbourhood, roused by the glare, collected and did what they could to assist the injured. Fortunately Mr E Barltrol, of Feilding. was returning from Rongotea in a car and when apprised of the happenings drove post haste to Feilding and returned with two constables and a doctor, who communicatcd with the Palmerston North Hospital, from which an ambulance arrived at 3 o'clccK. The condition of the sufferers was made more trying by the lack of clothing and the raging gale and rain. Mrs Sutherland was the most serious case owing in the loss of blood. Burns were sustained by Mrs Drummond while wandering half-dazed in the burning house. Her husband received several blows but they were not serious enough to prevent him from fighting successfully for the lives of his wife and daughter and his grandchildren. The police made a search, of the neighbourhood without result and when they returned to Feilding all stations were advised and special instructions were forwarded to Ratana's camp, whither, it was thought, the wanted man would make. A warrant for his arrest was issued to-day. In November last Sutherland was brought before the Feilding Court on a charge of assault. A resident of Awahuri this evening ascertained that the police had traced Sutherland to the bridge over the Rangitikei River at Bulls. He is described as 5ft l0in in height, and was wearing a blue suit and grey cap, and a returned soldiers’ badge. Sutherland, who was aged 31 years, saw service in France with the air force, and it is said was the only Maori member of that body. Both victims passed a fairly good night, Mrs Sutherland is still in a serious condition, but Mrs Drummond is not in danger. He gave himself up in April and pleaded guilty in August 1926. He was sentenced to seven years hard labour. The British Journal for Military History is a Open Access, peer-reviewed journal - see The Dominion of the Air for useful context. Welcome to Issue 2 of our fourth volume. In this edition we are very pleased to bring you a series of articles on British and Imperial airpower during the First World War. This is awesome, Elliot King's RNAS Short 184 floatplane N2648 "KIA-ORA".